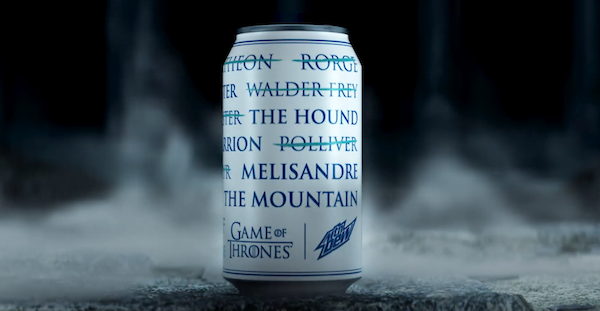 “A Can Has No Name” is a limited-run, special edition MTN DEW can inspired by beloved character Arya Stark and her training with the Faceless Men of Braavos. Faceless Men are a mysterious guild of assassins trained to relinquish their former identities to become “no one” When warm, the cans appear brand-less. Once chilled, they reveal Arya’s iconic kill list, a tribute to those killed and a glance at her remaining targets for the final season. Print article This entry was posted by Art Eddy III on March 28, 2019 at 8:09 am, and is filed under Entertainment. Follow any responses to this post through RSS 2.0. Both comments and pings are currently closed.